Whenever I come back from a vacation, I try to treasure some of my favourite moments by making a sketch on a canvas. During our last vacation I had a wonderful time star-gazing with Akshara on an island somewhere in the Indian ocean. This time it was a similar destination in the Bay of Bengal – The Andaman& Nicobar islands. 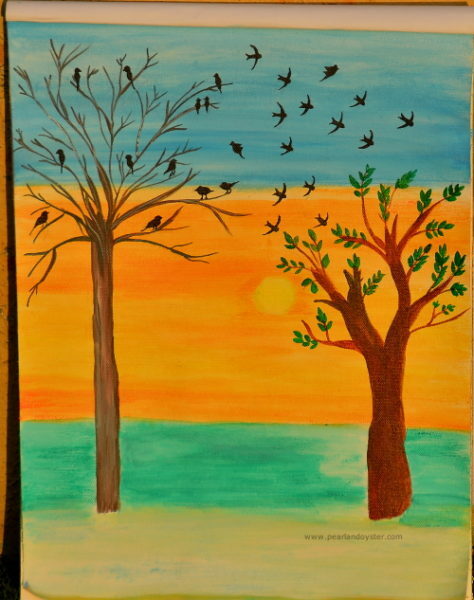 White sand..pristine beaches..Yellow sun..Blue sky, all reverberating the sound of the chirping birds, a sight to cherish & remember.This painting is a reflection of what I witnessed from the balcony of my room. It was a everyday morning routine for the birds to keep moving (as a group) from one tree to another. The usual one cup of tea took much longer just observing these birds 🙂 I am sure the walls in my home would be happy as well to echo the serenity of this beautiful island. Next story A riot of colours !